Before the Beta test version of the Skeleton Crew RPG is unleashed upon the world, I thought I’d share some notes from the Alpha testing. What follows is a brief recap of the 1st test campaign, and a more in-depth look at the first session of the 2nd campaign. Skeleton Crew didn’t start as a game… it started as a comic, written by my sister, Monica Marier, with art also by Monica (she’s talented in a plethora of fields… it’s kind of annoying.) Some features, such as Zomboy the lovable zombie, the toddler medium Peek-a-boo, and the city of New Manchester, were borrowed from a superhero story I was writing; and while the capes are gone, the same over-the-top, anything-can-happen mentality persists. Minotaurs? Sure. Alien invaders? You betcha. Vampire chimpanzees? Check out issue #4. It’s that same flexibility that inspired us to turn Skeleton Crew into an rpg- a world this weird could hold hundreds of strange adventures, with any mix of hero types. Shortly into its genesis, we became aware of FATE, and the wonderful, malleable system it offered. Since we were writers before we were gamers, the story-driven FATE system seemed a perfect match (aaaaand the fact that it’s free to publish under OGL didn’t hurt none neither.) We modded the skills, built us a framework, and gave it a go. RPG – Early Days – You want WHO to GM?!? The first draft was done, and it was time to give it a whirl. Unfortunately, no one in our group really had spent as much time with FATE or the rulebook as myself (the head writer.) Which means that the GMing for the first half-dozen games fell to me- someone who never GMed before in his life. Heck, I’d never played a decently run rpg game until a few years ago. I ran a few one-shot games and tweaked things accordingly. It was time for a real campaign. Just like the Fate Core book suggests, we established world issues and problems, which set the stage for a nasty new street drug called “Roar,” which is turning the users into mutated monsters. All sources lead to Merrick Industries, and their shady lead developer, Dr. Socrates Madonna. During the last adventure, the group followed the clues to a rival street gang selling their own knock-off version of the drug, called “Gronk,” which transformed its’ users into Chupacabras. We never finished the campaign, sadly, but I learned a lot from my plucky players. Any further one-shot test games seemed to go well, with positive feedback from co-writers and strangers alike. However, whenever a hiccup occurred, I couldn’t tell: was it a flaw in my adaptation, or a gaff from a rookie Gamemaster? Even when we played around with other Fate & FAE game settings, it was always left to me to run the show. The Team – this is one of unique features in the Skeleton Crew game. When playing Skeleton Crew, you don’t need to pin down the genre, as it’s already loosely defined- supernatural + comedy + horror + adventure. However, there are hundreds of different variations within that, and in our test campaign, we found it far too easy to slip into a subgenre that the players weren’t anticipating or wouldn’t welcome. Before creating your characters, the group agrees on a Team Concept – this is the motivation and role of the team. Some examples we include in the SC rulebook are “Monster Slayers,” “Paranormal Investigators,” “Freaks on the Run,” and so on. Having no idea what Steve had in mind, we went with one of the most versatile team concepts, “Mercenaries for Hire.” It doesn’t matter what it is, if you pay us, we’ll do it. Next, I poured over the Skeleton Crew character types, looking for inspiration. A large chunk of the SC RPG book is composed of the Mortal State & Professions sections. If this was a fantasy hack/slash, those would be the Race & Class section. Mortal State – The living / unliving condition of the person. There’s boring humans, of course, but also lots of undead & inhuman options: zombies, ghosts, fey, frankensteinian constructs, and so on. Unlike Dresden Files* RPG, playing one of these monsters doesn’t come with a grocery list of issues or existential drama- a zombie can be just a normal guy, except a little smellier and harder to kill. Professions – The occupations of people- as you’d expect, there’s researchers, slayers, mystics, mediums, mad scientists, etc. These are mostly to spice up any human characters, but there’s nothing to stop an undead person from being whatever profession they want too. While a creative** guy like me would have fun inventing a brand new character that’s not in the book, I thought it best to test one of the mortal states or professions that had been absent from our test games. I decided to go with the Mystic- the character able to see the past, present and future through their psychic powers. Why a Mystic? : Because unlike a slashing slayer, the Mystic can do something in Fate that he can’t easily do in other game formats: he can help shape the story. A mystic works best when you have a genius GM- someone who can give you extremely vague hints of what’s to come; or, as an alternative, lets the PLAYER come up with the future vagaries, which will be folded into the narrative. When I came up with the mystic, the inspiration for the vague predicting power came from the X-Files episode, in which a psychic asked about the location of a body. He tells them of a “fat, white, Nazi stormtrooper.” Later, at the murder site, Mulder & Scully see a propane tank that, if you kind of squint at it, looks like a fat, white, Nazi stormtrooper. The predication: a hint that’s completely useless and random in the present, but will help confirm something in the future. Zultano is a man of mystery… and by “mystery,” we mean “bald faced lies.” He frequently spills out stories of his past, all of which are contradictory. The only facts you that seem to stick is that he spent many years in a circus (as a fortune-teller, knife thrower, and many other odd jobs,) that he’s had a fortune-telling booth (possibly out of his van,) and that he is occasionally hired by police as a consultant. His accent is of vaguely Eastern European origin, but like the rest of him, it could be complete fantasy. He is capable of receiving actual visions of the future, but he “cries wolf” with so many fake predictions, it’s hard to actually believe him. Pre-ja Vu – Once per scene, may use Sixth Sense to attempt to see the future. The future comes in an extremely vague, dreamlike manner – a blurry image, a snippet of a dialogue, a general emotion, etc. This prediction may be created by the GM, or the GM may let you create it. A successfully created future aspect has a free invoke on it. If or when a future scene includes something close to your prophesy, you may invoke the aspect to help you get an edge on events (ex. dodge an attack, to predict a character’s response.) You cannot have more than three successful prophecies per session. I See All – Gain +2 to Deception when using Create an Advantage to convince someone of a fake prophecies relating to him or her. Silver Throwing Knives – When using your silver knives, you get +1 to Shooting and Fighting when Attacking Vampires, Werewolves, and any other undead weak to silver. Other People’s Moneys – You have tons of wallets that you’ve stolen earlier. You may use Burglary instead of Resources when spending cash & credit. Team Part II – Next was the Team Dynamic, which is the general attitude of the teammates towards each other- friendly? familial? This would appear as an aspect, such as the Unfriendly dynamic aspect, “If We Get Chased, I’m Tripping You.” We went with “Tossed Together,” meaning our group starts a little jumbled and untrusting. Each person has been in the company for a little, but have done most of their work solo, working with one or two others at most. Luke Temple – A LARPer possessed by the ghost of a warrior mage. He wears a cheap Partay City ren faire outfit, and is armed with foam weapons, which carry with them ancient magic for smiting the undead. Everyone thinks he’s crazy, as he screams and yells at ghosts his friends can’t see. Donal Sidhean – A fairling (half human, half fairy) pest exterminator. He seems to have some connection to the pied piper of Hamelin, but what it is exactly is unclear. Andrew Fletcher – Dhampir (half human, half vampire) that’s a vampire slayer, without the emo attitude. He’s a working class Liverpoolian thug with a crossbow and a smile. – A massive Clockwork Golem – with a chain gun. Our first session ran a bit long, so before we left for the night, we brainstormed some local Urban Legends. Load of Croc – New Manchester Civil Engineers have witnessed squid-crocodile hybrids – henceforth known as “sqrocs” – breeding in the sewers below the Dockland area. Xenoarcheology – Hubris U was stirred as a promising young adjunct professor published a paper declaring that aliens influenced ancient civilization, and that they are secretly walking among us. The Heads of the Archaeology Department were quick to rebuke it, citing substantial evidence indicating that all alien life forms on Earth went extinct long before humans ever evolved. Bi-Weekly Globe – A tabloid article, titled “I Married a Sparkly Vampire.” The new vampire groom supposedly has skin that shines like diamonds, drinks deer blood, smells like maple syrup, and looks like Robert Patterson. The editors claimed that Robert Patterson himself was unavailable for comment. It’s been Nearly a month after GenCon, but I am determined to finish my synopsis of the play testing. So, I’ll skip to the good parts. Dungeon Tours – So far, at most of my games, the average age of players was 20ish, and the gamers were pretty green. Even before I started my game of Dungeon Tours, a caper / construction game set in a Fantasy-Adventure world, I could tell this would be different. The average age around the table was older than me, and some had probably GMed before I even knew what an rpg WAS. When picking characters, they opted out of picking the silver-tongued Bard (though I reminded them it was a game about running cons.) One gentlemen in particular, sighting opposite of me, worried me the most. Pre-game time, I barely got a NAME out of him. The second the game started, I realized that my fears were unfounded. The stern-faced individual (we’ll call him the Rogue, after his character), immediately livened up, and took gentle charge of the operation. The party immediately jumped into it, and quickly founded a loathe/hate relationship with the drunken noble serving as sucker client. The built a piratical adventure, featuring everything from fake musical puzzles, real graverobbing, fake trapdoors (that they might have forgotten to make “fake,”) and using a cannon as a tactic in contract negotiations. 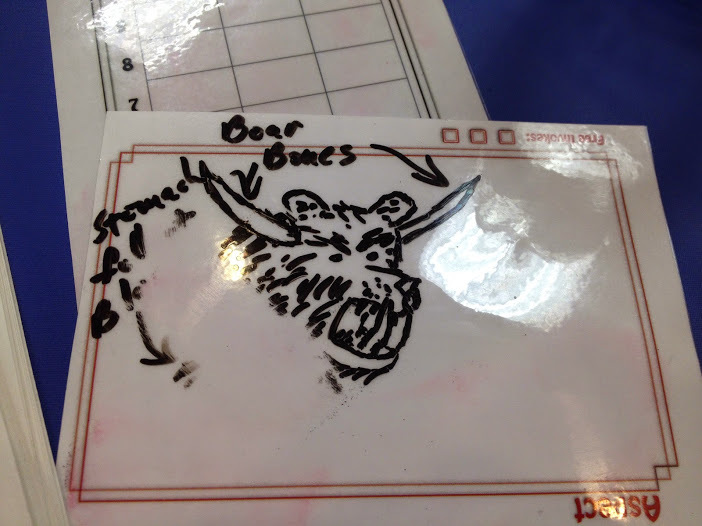 No doubt, the star of the show was the taxidermied bear-boar composite fake monster, who was named “The Jeff.” I asked for an illustration, and they did not disappoint. Feedback: Most of the feedback, it seemed, could be handled by GMing it better, it appears. I had forgotten one of my own rules, and as such, the board was littered with free invokes, making the game far too easy. The players, all of whom were new to Fate, were unsure of where my new rules started and where the old rules began. In the future, I’ll try to distinguish, “you’re testing THIS” before set-up. Masters of Umdaar – for those who don’t know, this was a game I’d been working on since last spring or so. We signed up for GenCon, including 2 sessions, and then, to make a long story short, Umdaar was picked up by EvilHat as a supplement in the Fate Adventures and Worlds Patreon. …it was on the laptop, back in the hotel. Dag. So, I took my buddy & GMing-guru’s advice, and I had them pick random animals out of a bag- I had brought with me an extensive collection of plastic toy dinosaurs, fantasy army-men, and other toys that I had purchased at Toys R Us and the Dollar Tree. One session had them facing off against a Mutoats (four-armed, mutant goatmen), the next group against the sneaky Centauripedes (insectoids that were Humanoids from the waste up, and centipedes from the waist down.) The final arena also featured such random threats as Megarats, cyborg Rozebras, and Lazerwolves (with robotic lazers on their tails, of course.) To keep the game under 2 hours, I had them on the rails for the whole adventure, (heck, the tunnel didn’t even have any forks), but they both tackled it in completely different ways. I never noticed how well Fate Core & FAE lends itself to cinematic adventures: If a player wants to overturn a fiery basin, climb a random chain, or swashbuckle from the ceiling, Fate makes it fast and easy. Feedback: All seemed very positive. I’d love to test out a game without the “rails” given the chance. SKELETON CREW – This was our last game of GenCon. After this game, we’ve got a 10 hour trek home, before I start a brand new job the next morning. I love GMing, but we’re all ready to go home. During set-up, Vince Salzillo, head of Double Exposure, comes over and says, “I’ve got some great guests lined up for you.” We don’t doubt that he’s got a good group, but I just nod, smile, and thank him. It would seem that the Vince-man does not exaggerate. The event starts up, and Vince starts the game selection process. It’s on the far end of the hall, so us playtesters only hear every third word. Suddenly, I hear him drop my name, and he points in my direction. He asks me to wave, but being the goofball I am, I start waiving both arms, a la one of those fan-blown figures outside of a car lot. He then announces to the room who will be joining the game: Rob Donague and Fred Hicks of Evil Hat. I drop to the floor (only half of it acting.) Let us be brief and say that my thoughts were no longer on going home. The group testing at the table was probably the perfect mix you could hope for for a playtest: two people (a couple) that had played rpgs, but never Fate; a young gentleman who had played it a litter (who was also a super-helpful aide for Double-Exposure, taking a much earned break); and two pros (Fred & Rob, who kinda invented the system.) I introduced the system basics, and passed around the character sheets. The couple picked Peek-a-boo and Weston Peese respectively (and she even spoke in a little pre-schooler’s voice), and the aide took on the geeky hero-in his own mind Zomboy. Fred asked for a simple character (it’d been a long con,) and took on the role of Caomh Culainn, the Wight Berserker, while Rob gave the Mad Scientist Doc Turnell lots of life and even more melodramatic volume. What was tested? : Our tweaks to the Fate Core system aren’t too elaborate, especially in a simple pick-up game. Our skill mode didn’t seem to cause too much confusion (one exception, noted later), and players seemed to really enjoy the “Round 0” effect, which lets players set up the conflict before punches are thrown. Steve and I were both really pleased by the Team Spirit teamwork system, which we had only conceived of the night before. Previously, players had interpersonal aspects and a team concept- but that was the first time we had merged it onto a Team-Character Sheet. Rob and the Aide picked the interpersonal aspect of “Former Enemies,” which meant the Rob would constantly bellyache how the Doc (in his more megalomaniacal days), had been thwarted by the idiotic Zomboy… to which the aide would play Zomboy as a dumber and dumber still (it was a vicious cycle). We had hoped to test “The Final Round,” but with a 2 hour playtest, we had to concede the fight before I would have liked. Feedback – Rob had a question with one of the skills (Engineering) which I later got a chance to clear up… hopefully the full rulebook explains it better than I can. 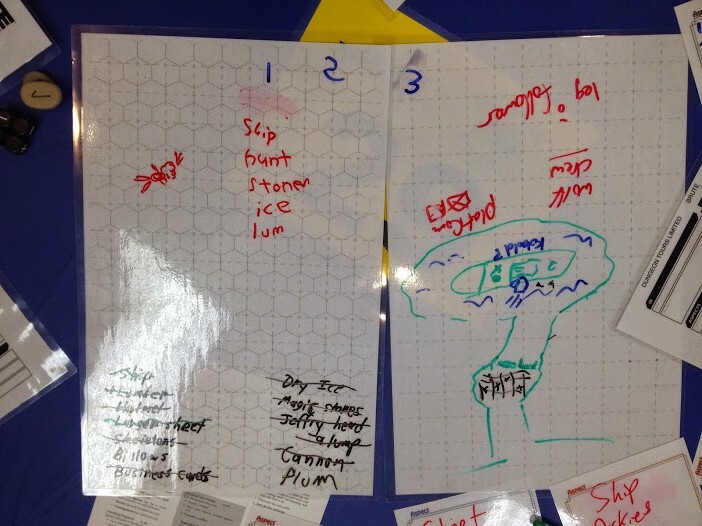 Everyone seemed to really enjoy the dry-erase Fate Game Aids. Learning from Dungeon Tours, I tried to make very clear from the beginning what they were being tested on, and several players seemed interested enough to sign up as playtesters. Speaking of which, guinea pigs players are now allowed to sign up for the Skeleton Crew RPG beta test. Submit a form, and receive a FREE copy of the BETA test next month! Local – At one or more local Northern Virginia hobby stores. Online – Through one or another online gaming site / program. Details and dates to come, but if you have any preferences for online game sites, or would like to see us at your local game store, leave a comment, and we’ll look into it like Shylock Fox. Stay tuned! 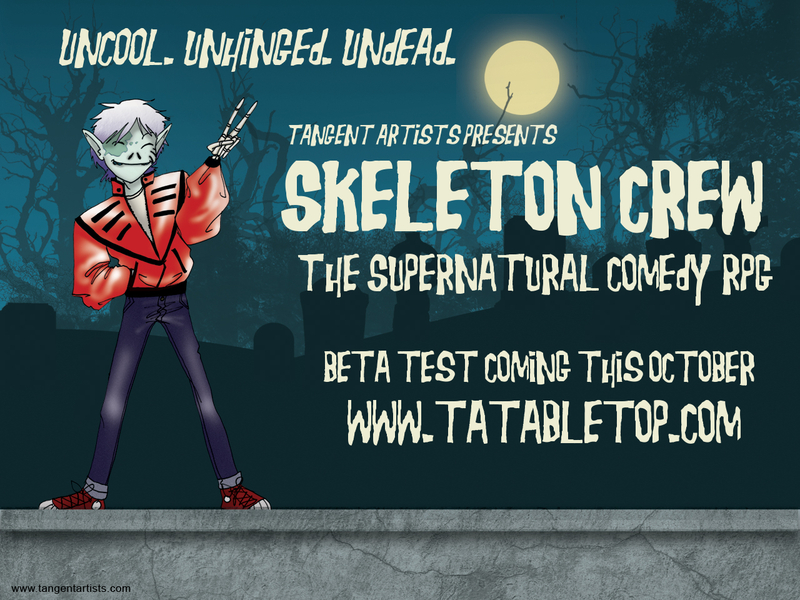 Skeleton Crew Beta Test – GET OUT OF THE KITCHEN! It’s official: this October, we’re releasing the Beta Test for the Skeleton Crew RPG! If you’re an interested in being a playtester, watch this spot- very soon, we’ll give you information on how you can sign up. Jynx is an Enchanter, who focuses on creating potions, charms, and artifacts on the spot. Jynx is a natural at aleuromancy- or as Jynx’s teammates dub it, a muffinmancer. Jynx’s baked goods used have strange effects on its consumers, changing their moods or energy. After years of practice, Jynx’s treats now have an effect even if they’re not eaten- breaking open a devil’s food cake can release demonic energy, while the gingersnaps actually snap. Jynx always preps dozens of treats before every mission, but also brings a battery-operated EZ-Cook Oven into the fray, just in case. Weaponized Magic – Flour Power Spell – Once per scene, you may summon a spectral fist of flour, and may use Fabricate as if it were Fight, to deal a close range Attack. Alternatively, you may use this once to defend against a Fight attack. Specialized Magic – Tantalizing Aroma – You gain +2 Rapport to Overcome rolls when convincing weak willed individuals (aka mobs and lesser NPCs) to eat one of your baked items, if you have an item handy. Derived Magic – Enchant Grain – You may use Fabricate to Create an Advantage to attempt to quickly make a baked good with a magical aspect attached to it, or place an aspect on an existing baked good. This aspect can be a property belonging to the food (ex. Luminescent Crescent; Exploding Nut Muffin), or a property that is passed on to anyone who eats it (Love-Potion Lemon Square; Naan Bread of Nausea). You can also use this to bake useful items and tools, like rock-hard battle baguettes or a sturdy pumpernickel ladder. Likewise, you may spend a Fate Point or a muffin-based invoke to already have a baked good with that aspect all ready to go. Permission to copy for personal use! Speaking of Sneak Peak, I thought it’d be a good idea to give you a tiny peek. Why? Because we want the phrasing to be just perfect, and we’d love your opinion on the following section. Which section? When you’re creating your character, take a moment to consider your character’s gender, genders, or lack of gender. Your character can have the same gender identity as you, or something completely different. We encourage players to keep an open mind about how their characters, and characters belonging to other players, choose to identify themselves. Also, feel free to think outside the limitations of reality; considering Skeleton Crew is a world of magic and super-science, it is perfectly possible for a character to change their own chromosomes with the flick of a switch, or the flick of a wand. Currently the rulebook has many instances of “him & her” and “his and her,” although we’ll try to replace most of them with “them” and “their.” We probably won’t get them all by Beta, I’m afraid. So please, tell us what you think. Can we phrase it better? Is there anyone / any gender-related topic we’ve left out? Let us know.